Learning programming and how to code can be a very daunting task. Where do I begin? What language do I start with? What’s the easiest way to get my feet wet with code? The questions can be endless. So, in order to help you out, I’ve gone and compiled the best websites to learn coding. **Note: The websites I have listed below vary between FREE and PAID. Some of the websites are completely free, and others require some sort of paid subscription before you can access anything. However, most of the websites are a hybrid in that they offer some free content, and offer even more content with a paid subscription. I have each of the websites marked appropriately in the titles to help you know which sites are FREE, which sites are PAID, and which sites are both. Four words: Code School is awesome. Through all of my research, this has been my favorite place to learn coding by far. It gets you hooked and wanting to learn more through the use of an awesome interactive UI, gamification (earning points for challenges, etc), and visualizing path progress. When I signed up for my first month, I worked on Code School for 3 weeks and learned more in those 3 weeks than I learned in an entire semester class of web development. When you consider the cost of going to school, the small monthly fee is next to nothing to learn how to code. Trust me, it's worth it! Best of all, you can pause your account and cancel any time you'd like. Try Ruby on Rails for free! Codecademy is the first site I used online to continue learning how to code. It is one of the best known sites for teaching people how to program. Best of all, it's all FREE! Yep, that's right, you won't pay a cent to do any of their courses. If you're completely new to coding, this is where you should start. Once you have done some of the courses and have a grasp of it, I would suggest moving over to Code School where they go more in depth in their courses and have very effective ways of teaching more complex concepts. Codecademy's site uses a very simple, nice looking UI and there is nothing complex about the site which makes it perfect for a beginner to navigate through the site and start learning to code right away. Choose the programming language you want to start learning and you're off and running. There are also some fun little projects they offer on their site that you can do like building your own galaxy where the planets rotate around the sun! Treehouse is similar to Code School. You can choose a desired coding path that you want to pursue, and then it will take you through a series of videos and coding exercises to teach you specifically about the path you chose. Treehouse has over 1000 videos that teach web design, coding, business, and more. Their library of content is always being updated with the latest and greatest web technologies, so you'll never get bored or run out of things to work on! Some things you can learn on Treehosue is how to build a website, how to code in various programming languages, how to build an app, and how to start a business. If any of these appeal to you, go check it out! Free Code Camp was established in October of 2014, and is really taking off. After just over a year, they have established over 130,000 campers (users). Those campers have completed a combined total of nearly 6,000,000 challenges on their site already. Free Code Camp is really cool in that it takes a similar approach to other coding sites except with a different, unique twist. Your goal on the site is to eventually work towards a "Full Stack Development Certificate", and the path to get there is laid out very nicely. Various challenges are broken into sections with estimates of how many hours it will likely take you to complete them. There are two very distinct sections: 800 hours of "Practice" and 800 hours of "Real Work Experience". Once you complete your 800 hours of practice, you will earn your "Full Stack Development Certificate" and then you can go and work 800 hours on real-work experience coding for nonprofit websites. Pretty neat idea! All I know is that, if you ever made it that far, you would be set to find yourself a job as a developer real easily. It won't be any quick task, though. If you do spend as many hours as they estimate (a total of 1600 hours for both practice and real-world experience), you would be working on challenges and projects for nearly 67 full 24-hour days! And, unless you don't sleep ever, that is going to take a year or more for people that only have time to do this in their spare time. Nonetheless, I am currently working on the practice section and am about 70 hours into the challenges presented. Can't wait to see how far I get with it! Go to Free Code Camp! Coursera, for those that don't know, is an education platform that partners with some of the top universities around the world to provide free online courses covering all sorts of topics. If you're interested in learning how to code and other computer science related topics check out Coursera - Computer Science. Coursera is loaded with computer science related courses covering all sorts of topics - Software Development, Mobile and Web Development, Algorithms, Computer Security and Networks, and Design and Product. Coursera can be either paid or free. If you want to take the course and get a Verified Certificate, you have to pay for that. A Verified Certificate is just an official signed certificate from the school that hosted the course you took which proves you took the course and would be a good thing to have to show future employers. However, purchasing a Verified Certificate isn't always necessary for courses, which is why Coursera can be free as well. edX is a lot like Coursera in that it is also an education platform that provides free online courses from universities all around the world. They cover courses on a number of subjects as well, but if you're interested in coding/computer science then check out edX - Computer Science. If you didn't find a course you were interested in on Coursera or just want to check out more options, then check out edX's selection for sure. I have taken a couple courses through edX and really enjoyed them and learned a lot, all for free! edX offers Verified Certificates as well for their courses if you pay a small fee. This will give you an official credential from the institution that offered the course signed by the instructor. This can in turn be used to highlight your skills on your resume or LinkedIn profile. Just like Coursera and edX, Udacity is another website that offers online courses, but they also offer what they call "Nanodegree Programs" which are basically little "graduate" programs where you take an online course to learn about a certain subject very in depth and earn credentials when you are done to show off your work. Udacity's courses and Nanodegrees range in difficulty from beginner to advanced, so you're sure to find something that will fit your current situation. Watch people code live. livecoding.tv is different from everything else listed on this post. livecoding.tv allows you to go in and watch developers code in a real-time environment. Various developers choose to share their desktop and stream video of themselves as they code and work on various projects in all sorts of programming languages. This is one of the best ways to learn in my opinion. You can sit there and watch programmers figure out the same problems that you might run into while you are developing, and there is even an interactive live chat with each stream where people can discuss what's going on or ask the presenter questions. egghead.io is a website that uses a number of resources (lessons, articles, and courses) to teach you programming in a variety of different languages mostly through video tutorials. You can create a free account on the site to get access to some of these materials, but you can also pay for a Pro subscription which gives you access to much more in-depth content. Just as a note, most of the content on egghead.io covers more intermediate/advanced topics, so this probably wouldn't be my first choice to go and learn how to code if I didn't know anything about programming, but it would be a great resource once you start getting a grasp of some programming skills. Khan Academy is a really cool site that everyone should check out. Their focus is not specifically on programming, but they do have a "computing" section devoted to learning how to code, so that's why Khan Academy made it on this list. Khan Academy is a fantastic site to learn about anything really. It is labeled as a "personalized learning resource for all ages". Want to teach younger kids math? Khan Academy. Or perhaps you yourself are struggling with more complex math like calculus? Yep, Khan Academy teaches that, too. You can learn about all sorts of subjects whether you are 8 years old, or 80 years old, it doesn't matter. Subjects include math, science, computer programming, history, art history, economics, and more. If you are interested in the computer programming/computer science part of Khan Academy, check out Khan Academy - Computing. There isn't a ton of content, but there is plenty to have a beginner start to learn the basics in a fun, visual way. While you're on the site, go ahead and brush up on your math and science skills as well! 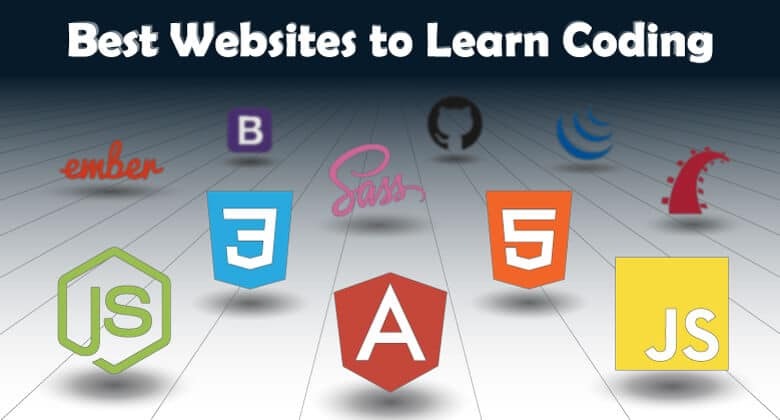 So there you have it - the list of the best websites to learn coding. Hopefully this list helps you out if you are aspiring to learn how to program or just want to improve the skills you already have! Do you have a favorite site to learn programming that isn't listed? Let me know in the comments! I didn’t “forget” any. These were the top 10 that I used. With that being said, I will look into sololearn! Thanks for the comment.